The Six Plants I Can't Live Without. I was not one of the ten chosen, but who says that means I can't chime in? Most people seem to be choosing flowers and other ornamentals - which is funny because they are essential to everyday life on this planet, but not in the direct way that, say, corn has become. Or wheat. Anyway, since everybody else is getting in on it, here's mine - in no particular order. It would be interesting to see how this changes over time, with gardening experience. 1. Daylilies (Hemerocallis). Gotta have 'em. Gotta have a bunch. Maybe I'll get sick of them over time... maybe not! They only last a day - how can you get sick of them so fast? I'd forgotten about this one red bee balm, by the way. It died off almost immediately, but now, like Charlotte's Web, has about a dozen babies growing in the front bed. 2. Thyme (Thymus spp.). Edible, non-edible, citrus, non-citrus... eat it, step on it, sniff it as you walk past: just give me the THYME! 3. 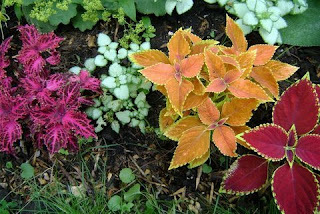 Coleus (Solenostemon scutelleroides). Of course! It's a mint, so it stands up to almost anything (except cold - what a wimp when it comes to cold!) and it's almost as varied as the rainbow. Lights up the shade, propagates oh so easy. 4. Tomato (Lycopersicon esculentum). Not so decorative, kind of weedy-looking actually, so why does it linger as one of my favourite plants EVER? Well, that's easy! Three reasons: yum, yum, yum. 5. Hosta (Hosta spp.). Okay, they are workaday and very much overdone in everybody's yard, including mine. But they grow and thrive with mostly neglect, come back reliably every year, and there's a lot to be said for that. Having said that, in this picture, they are clearly outshone in this picture by lamium, and even the lambs' ears. I have to tell you, lambs' ears came THIS close to being chosen as #5 on this list. Pretty clever, to sneak them in like that, huh? But just being green in the background is hosta's job... and it does it so well. 6. Yarrow (Achillea millefolium). The flowers last forever and you can't kill them. Got to love that. I know from my weeding they can get weedy... but with my backyard, weedy is what I want! Versatile and down-to-earth gorgeous in a bouquet. Plus, I really wanted to put a word in for my hard-working, bug-attracting golden tansy, so I snuck it into this picture, too. That's my six, for now! Maybe I'll update next year when my garden (and presumably me along with it) has matured!